Louisville’s economic development efforts should focus the quality of jobs created, not just the quantity. Emphasizing job growth in high-wage sectors will help more families achieve financial stability and reinvest their expendable income into the community. Additionally, the percentage of high wage jobs is an important factor for individuals who are considering moving to Louisville and joining the workforce. Louisville currently ranks 9th among its peer cities in the rate of workers employed in high wage jobs, with 42.3% of its workforce employed in high wage jobs. 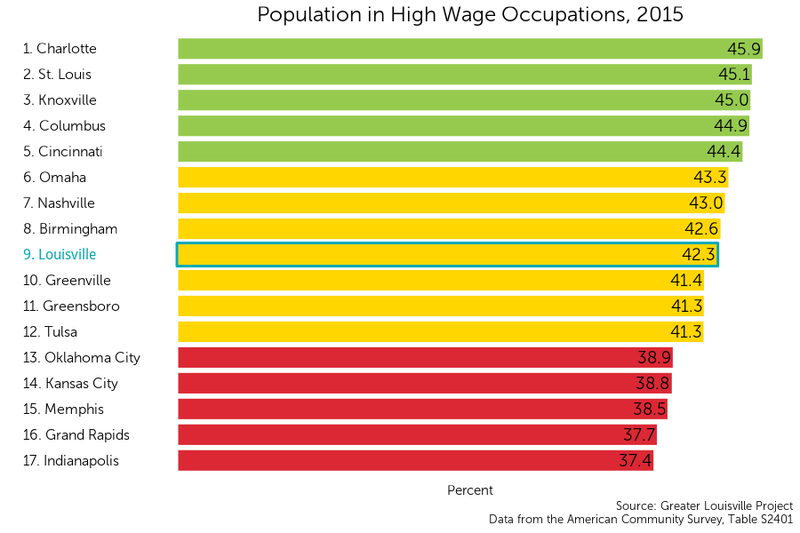 Jobs are determined as high wage if their categorical assignment within the American Community Survey has a median income of greater than $35,000. These industries include management professionals, law enforcement, and construction/maintenance. Where are employees in high wage occupations found in Louisville? Although Louisville ranks 9th out of 17 cities in the percentage of workers employed in high wage occupations, there is a clear geographical divide in where those workers live. In the map to the left, areas where more workers in high wage occupations live are displayed in green and yellow, while areas containing fewer can be seen in orange and red. More workers in high wage occupations live in eastern Louisville in communities such as the Highlands and Northeast Jefferson, where the highest percentage reaches 60%. In comparison, western and southern Louisville communities have the fewest workers in high wage occupations with rates as low as 11% in the California neighborhood. The rate of workers employed in high wage jobs has been increasing since 2006. 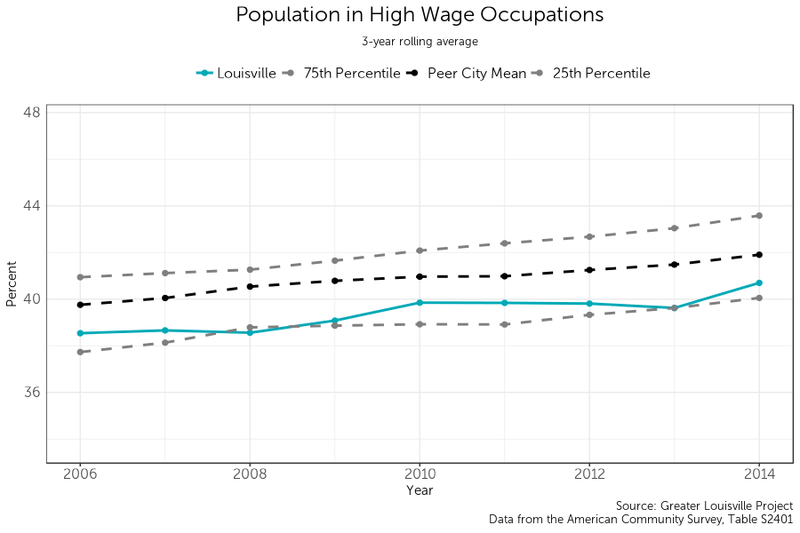 However, Louisville has consistently had a lower rate of workers employed in high wage jobs than the average of its peer cities.